Distinguishing Characteristics: Asian female. Black hair, brown eyes. Arellanosa has moles on her left cheek and near her right eye. Her nicknames are Becky and/or Monica. She is of Filipino descent. Arellanosa was last seen in Los Angeles, California on May 5, 2001. 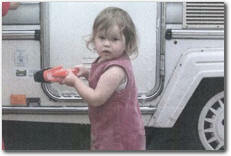 She was in the 10700 block of Lawler Street at the time of her disappearance. Arellanosa has never been heard from again. Authorities stated that she vanished under unusual circumstances. Arellanosa's case opened 2018 by Psychic Brian Ladd.